Together with the newly designed “Park Ouerbett”, the restaurant “Pavillon Madeleine” forms the new green centre of the community of Kayl-Tétange, in the south of the Grand Duchy of Luxembourg, close to the industrial city of Esch-sur-Alzette. 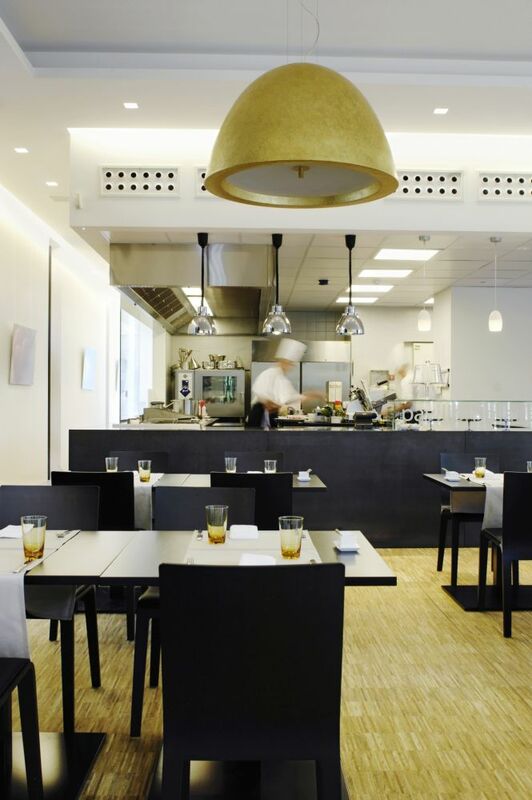 The restaurant building is located at the intersection of the north-south road linking Kayl to Tétange and the circular path of the park. 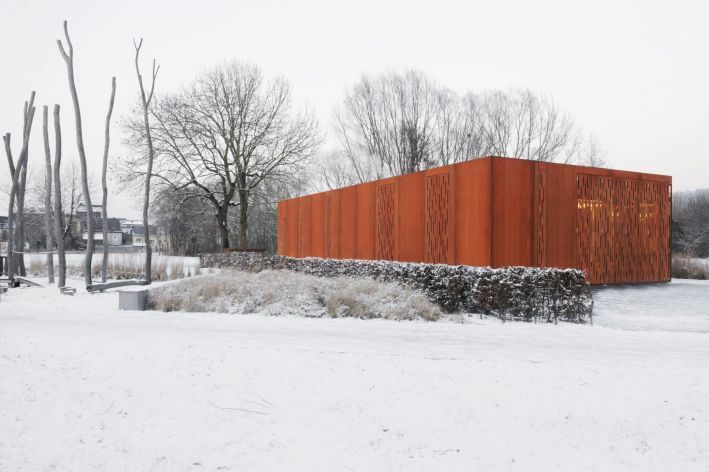 Its footprint of 10 m x 22 m x 4.5 m allows it to harmoniously blend into the park structure. 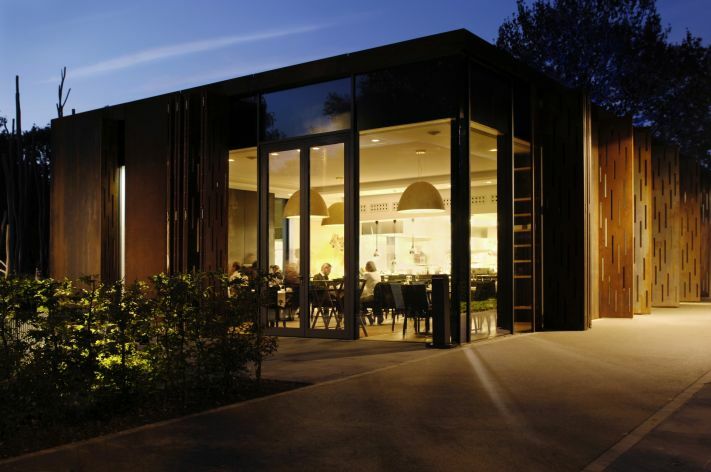 The open space at the front, which features an outdoor dining area with approximately 40 seats and a barbecue area, defines the entrance to the restaurant and leads guests straight into the inside of the pavilion via a glass door. Here there is room for a further 40 guests. In front of the pavilion, seating steps provide direct access and contact with the water of Kayl creek, the quality of which has been upgraded through cleansing and other minor improvements of its banks. All the accesses to the pavilion and the inside are designed to be barrier-free. 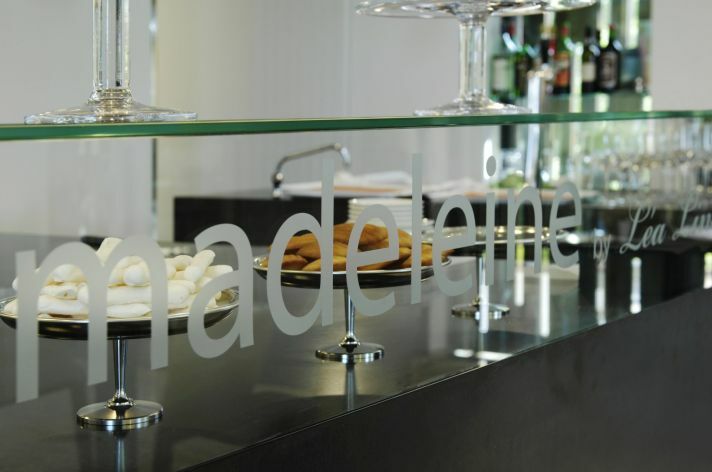 The restaurant boasts a generous professional kitchen and toilet facilities for guests and staff. The “Open Cooking” concept was developed with the help of internationally renowned executive chef and restaurateur Léa Linster. Food lovers not only get to enjoy a culinary treat but also benefit from an impressive visual introduction into the artistic preparation of the dishes. The structural concept relies on a pillar-girder construction, which is based on an insulated base slab. The pillars are arranged in a 2 m x 2 m grid and support the 10 m long IPE400 girders. All the steelwork components are prefabricated and bolted together on site. A Corten steel façade envelops the volume in a simple and modest cubature, which is interrupted by several storey-high glass recesses. The chosen vertical structure of the façade allows for an interesting play between the window surfaces and the closed areas. Minimised connection details and hidden building services in ceilings and walls create neutral and calm rooms. The chosen vertical structure of the façade allows for an interesting play between the window surfaces and the closed areas. Minimised connection details and hidden building services in ceilings and walls create neutral and calm rooms. 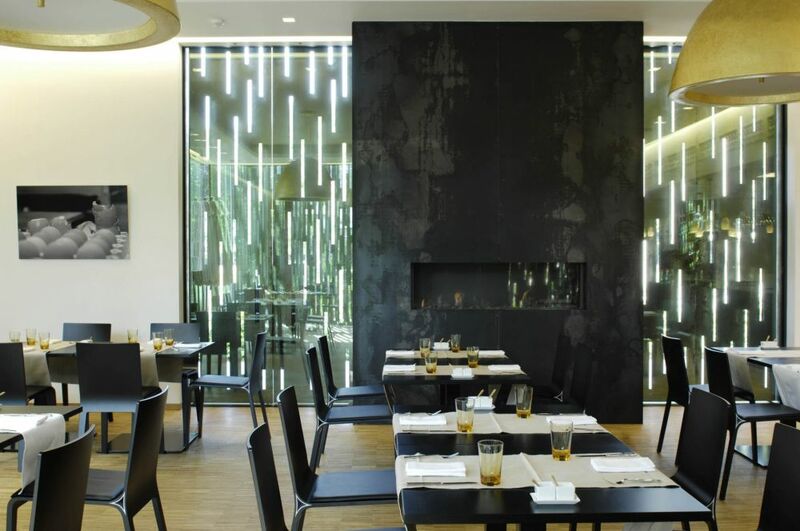 Harmonious material composition and generous ceiling heights within the restaurant ensure guests enjoy a high-quality dining experience. The unadorned walls contrast with the black steel chimney construction, the imposing wine cabinet and the bar made of the same material. The three elements emphasise the clear lines of the pavilion and transport its outer sturdiness to the inside. In contrast, yet blending in well with these elements, the parquet floor and the golden suspended lights provide a warm and cosy atmosphere, enhanced in winter by the fire in the chimney. As a result of the high requirements placed on the outer shell of the building, for instance with regard to the necessary resistance to vandalism or the harmonious integration of the structure in its green surroundings, particular emphasis has been placed on the materiality and function of the façade. The outer shell ensures this integration and a refined finish of the simple and modest geometry of the building. The use of steel refers to the cultural heritage of the steel industry in the country’s south. The versatile uses of the material are unsurpassed. This results in a strong connection of the building with the surrounding open space, thereby strengthening the identity of the park. 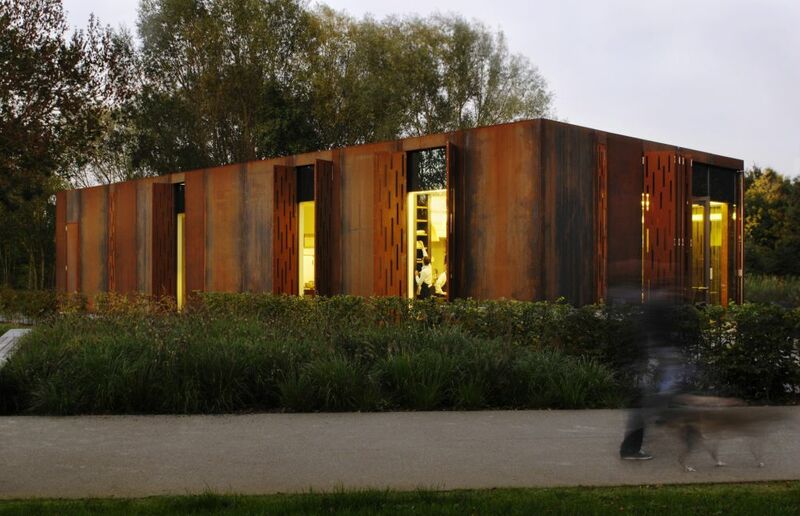 At night, the window surfaces are protected by slotted folding elements made of Corten steel. During the evening hours, these folding elements, whether open or closed, create a fascinating lighting effect to the outside. 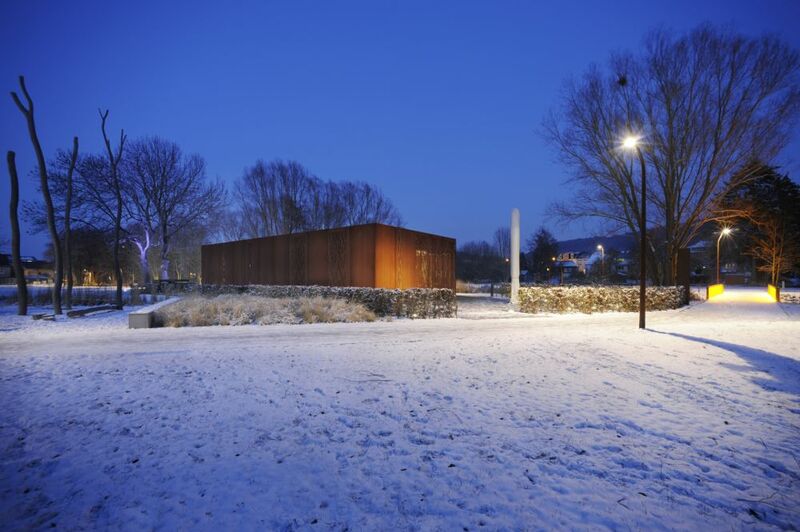 The energy concept of the pavilion complies with today’s technical requirements. 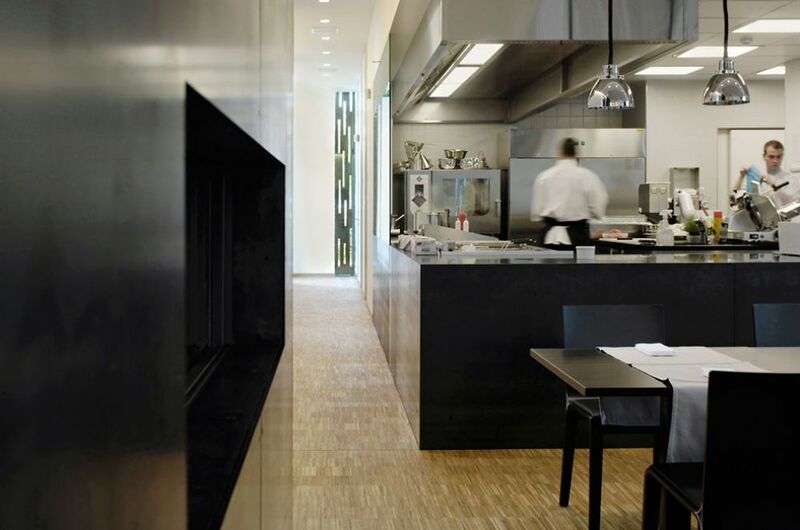 The controlled ventilation system, which exchanges the indoor air ten times per hour, ensures fresh air is distributed through the restaurant via long- range jet nozzles. The kitchen equipment, such as fridges, employs the latest energy-saving technology. Green roofs, solar cells, heat pumps and ground heat collectors are just some of the keywords that top off the overall sustainability concept of this building. 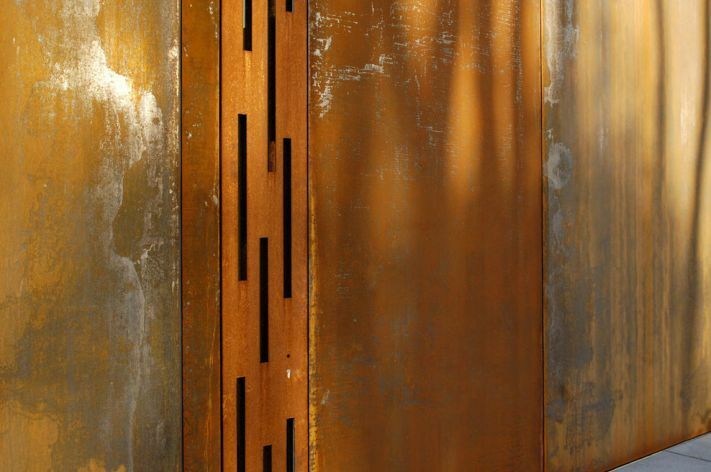 While the use of Corten steel results in a higher initial investment, it has proven to be particularly durable and easy to maintain. It also protects the inside from vandalism and allows any possible damage to be easily repaired. The sustainability of this material impresses not only during its lifecycle, but it is also completely recyclable. 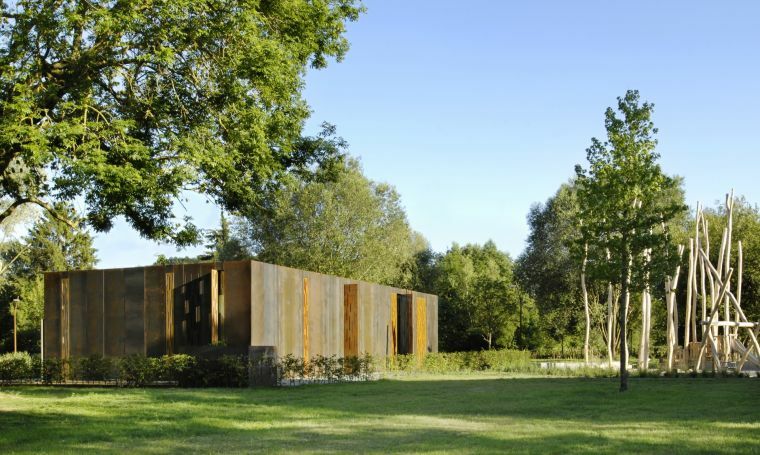 The inside of the pavilion reveals an emphasis on high-quality, natural materials with the use of black steel, oak and glass. 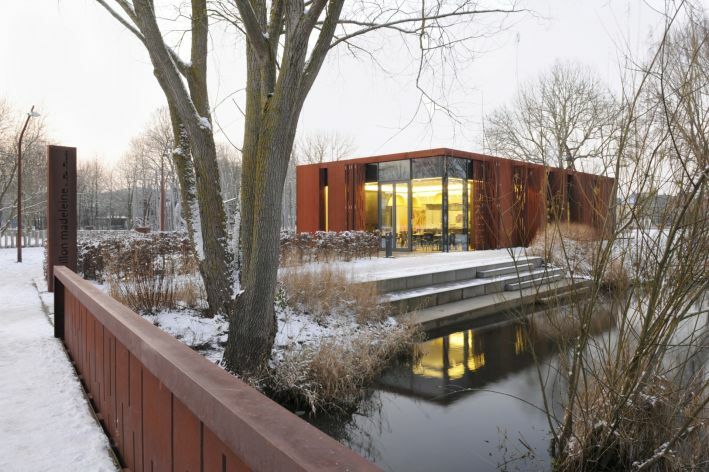 For reasons of sustainability and ecology, the building shell has been provided with above-average insulation; the walls have been equipped with wood-fibre insulation material measuring 240 mm in thickness. In addition, highly reflective glass ensures that in the summer the sunrays do not excessively heat the building.